Our fame is proliferated all across India as the matchless quality Y type pipe strainer manufacturer for resolving the age old issue associated with the clogging in the gas, steam or liquid flow stream. The invented Y type pipe strainer is placed in the pipe before the process equipment like meter, valve, regulator, etc in order to filter the unwanted sediments and prevent the clogging caused by thereof, wherein the high quality SS strainer is used to accomplish this process. As this type of Y strainer is colossally used in the pipe processing it is also reckoned as the pipe strainer in the market, which is as engineered in accordance to the ISO 9001:2015 standards to obtain the highest quality end product. The huge assortment of material (stainless steel, carbon steel, nickel plated, cast iron, bronze, aluminum bronze, etc) and the specification is available in this Y type pipe strainer in order to match individuals need to the farthest. 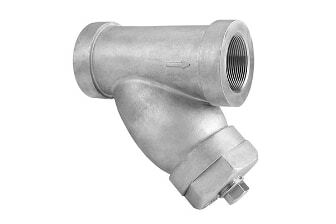 Correspondingly, the connection end of this strainer is available as per the ASME, DIN or BS dimension requirement. The entire range of the Y type pipe strainer is scrutinized as per the API standards and hence promises to deliver leak free and incredible performance spanning the life, is available in India as well as foreign countries at the lowest prices. No matter you need to install vertical or horizontal, our Y type pipe strainer is a cost effective approach.